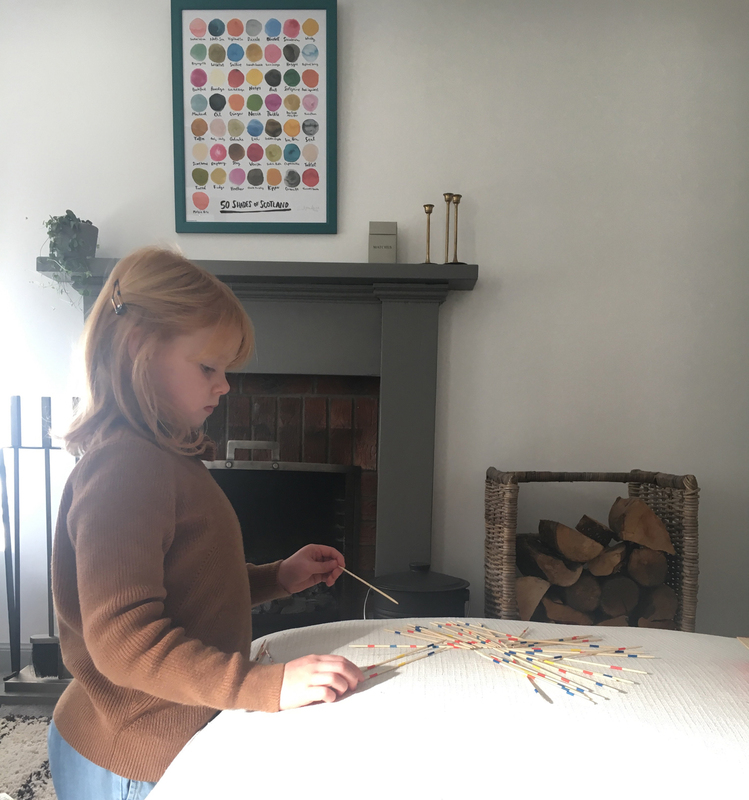 Nestled in the heart of Perthshire, Ballintaggart Farm is a magical destination full of personality, which is loved by each and every one of my family. Standing proudly in such a tranquil and pretty spot in one of my all-time favourite parts of Scotland, Perthshire, Ballintaggart is such an easy commute from Edinburgh. 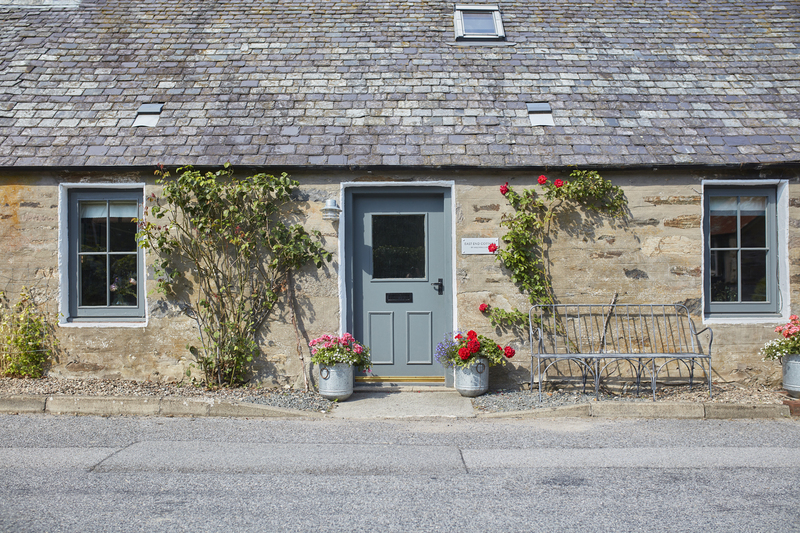 Set up only three years ago as a B&B and cooking school they have expanded quickly by opening up the dynamic, cosy, yet eccentric, Grandtully Hotel and a gorgeously designed cottage for a family to stay. 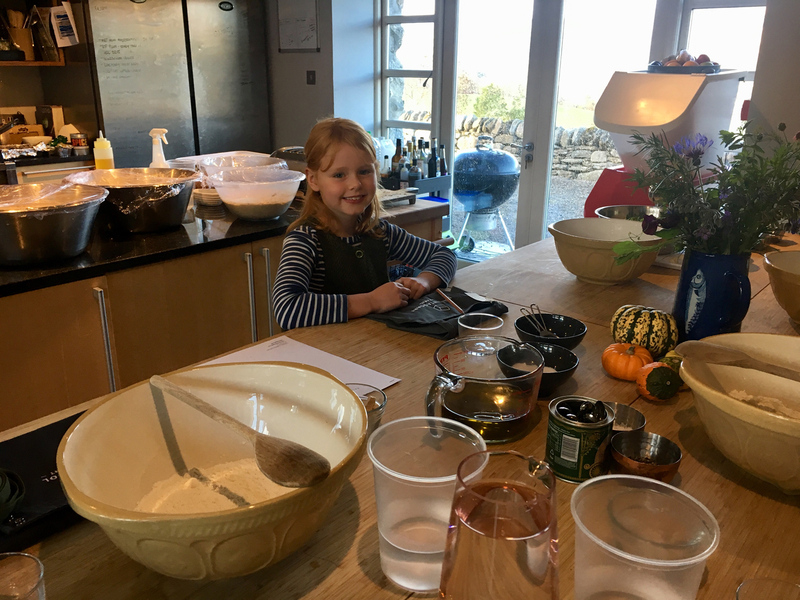 At the heart of Ballintaggart is the cooking school, run by Leith-trained Chris, this family run destination is truely a wonderful retreat for the weekend and one which brings the whole family together. We stayed here over a long weekend in the October holiday and the girls are still talking about our stay, each and every school holiday asking us, “When are we going back?” That’s a sign of a good holiday! 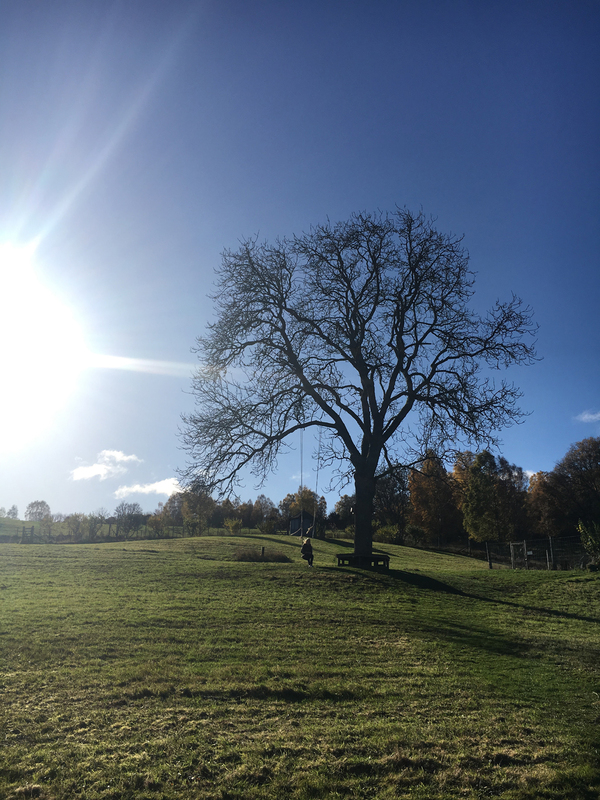 The farm is surrounded by luscious countryside and on a ‘blue sky day’ you can see Scotland in such beautiful glory. But there’s also more to Ballintaggart than the views, the kids had such adventures here. The kitchen garden was a great place to explore where all the greens were picked for our garden pesto, the chickens had Florence totally entertained, and then there’s the swing, the cricket run and even a tennis court. If you fancy taking it a step further, Ballintaggart Farm has produced some fabulous little postcards with local walks to enjoy, and they’ll even pack a picnic for you if required. 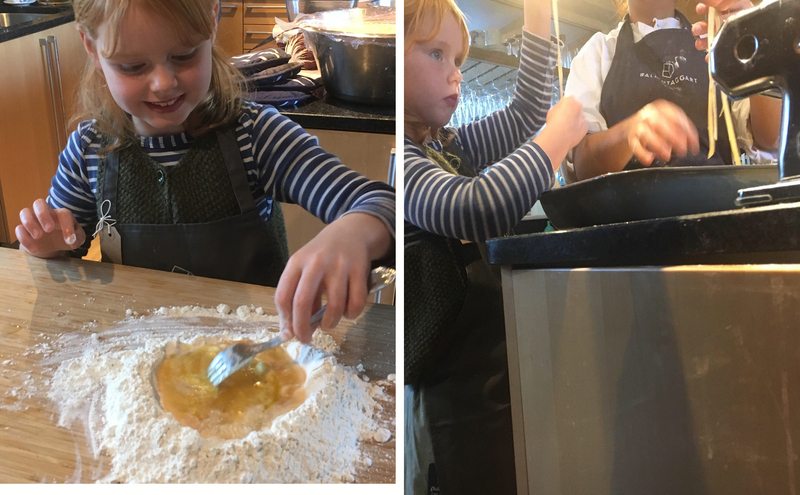 Upon our arrival we were all whisked into the kitchen and spent our afternoon together making fresh pasta, a garden pesto and the most tasty focaccia. We all had such fun cooking together especially with my husband getting involved. Seeing the whole process of pasta come together and the incredible taste mixed with the pesto makes my mouth water as I write. It’s something we’ll definately make again. Our cottage was a dream — just picture perfect. With two double bedrooms upstairs, each as comfortable as each other with crisp sheets and plush pillows and the bathrooms filled with Noble Isle products we were sure to have a blissful nights sleep. 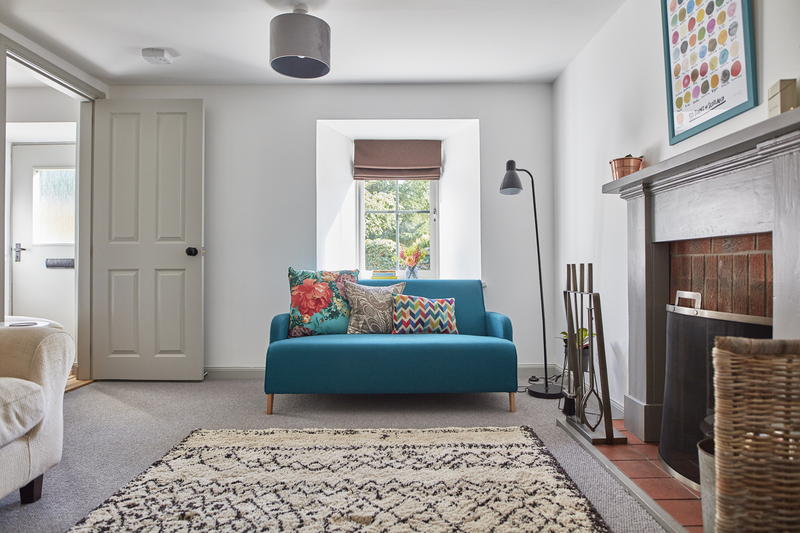 Downstairs is the perfectly stocked kitchen diner and the living room is delicately piled with children’s books and games. Of course one of my favourite things about Ballintaggart is the food. That evening we ate at The Grandtully Hotel, which is a short drive away from the cottage. 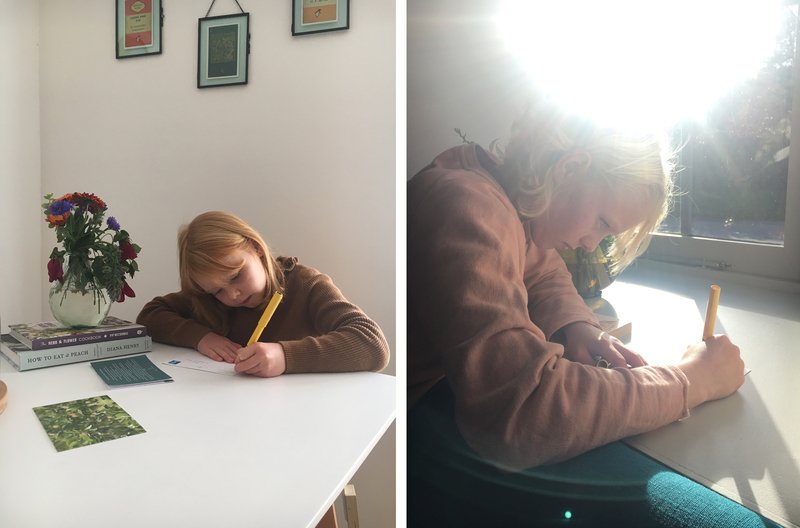 The kids menu makes my heart sing! Devised by the children of the local primary school, my girls devoured the sharing platter of homemade doughballs and crudités and humous, with perfectly carved slices of venison salami from local Great Glen charcuterie. Their main was a big decision but they opted for the DIY wraps and had such fun putting their own meal together. 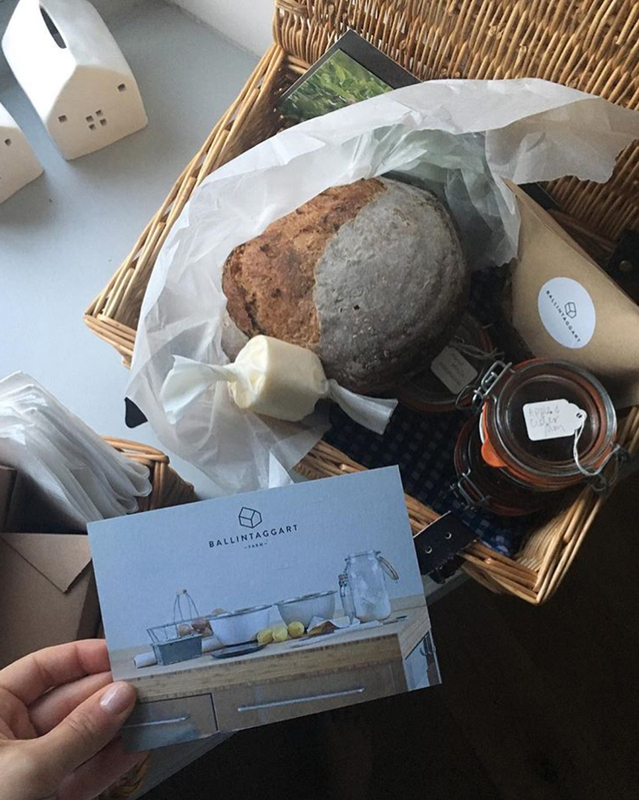 Breakfast was in the form of a freshly packed picnic hamper delivered to our door containing warm cinnamon buns and freshly baked sour dough, with pots of homemade jam and marmalades and fresh fruit pots. We absorbed every single bite! 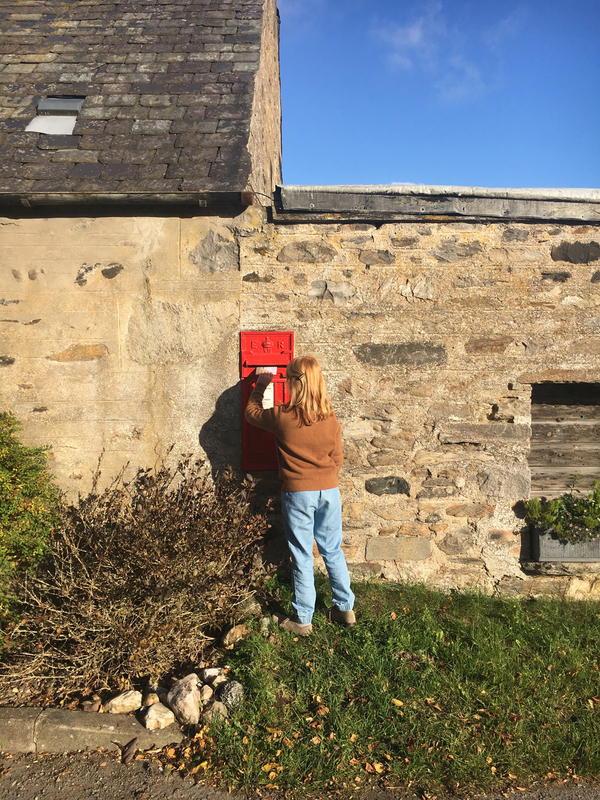 The girls loved writing out their stamped postcards which were gifted in the hamper, even posting them in the little red postbox by the side of the cottage. 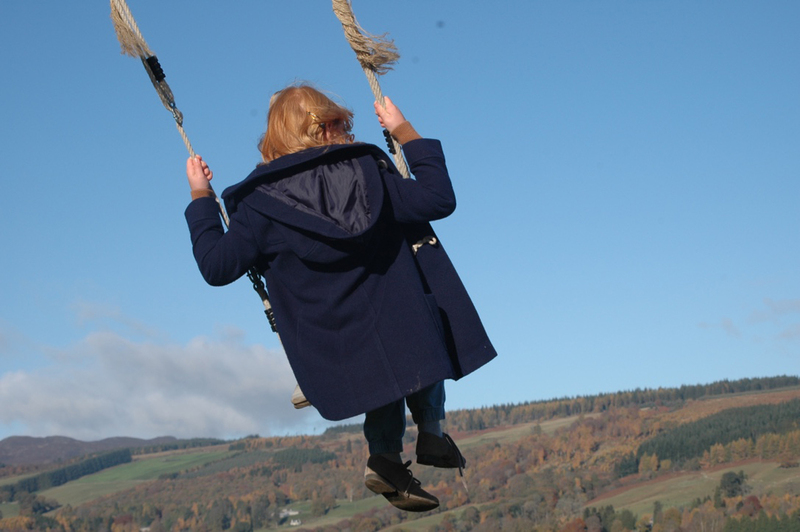 The surrounding village of Dunkeld has so much to offer families. 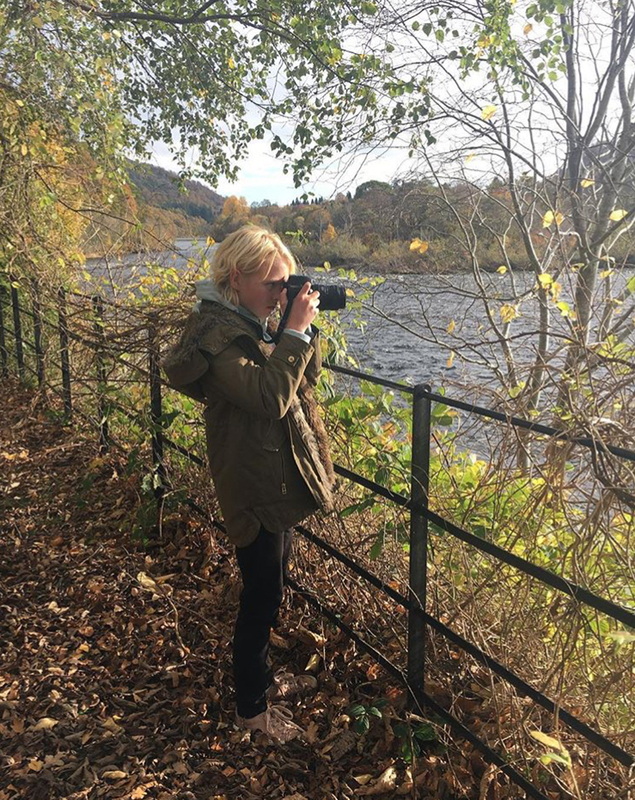 With the Cathedral itself, the Beatrix Potter museum and a walk along the River Tay, there is so much to explore here. 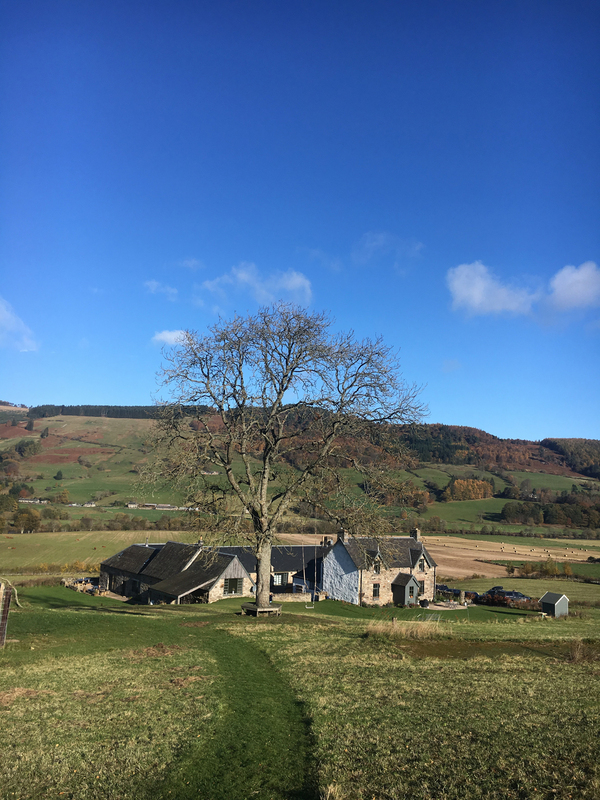 For a perfect Scottish weekend where you imagine log fires, fresh air, wonderful countryside walks, delicious food and an all time great retreat with the family I can’t recommend Ballingtaggart Farm enough. You will love it here! 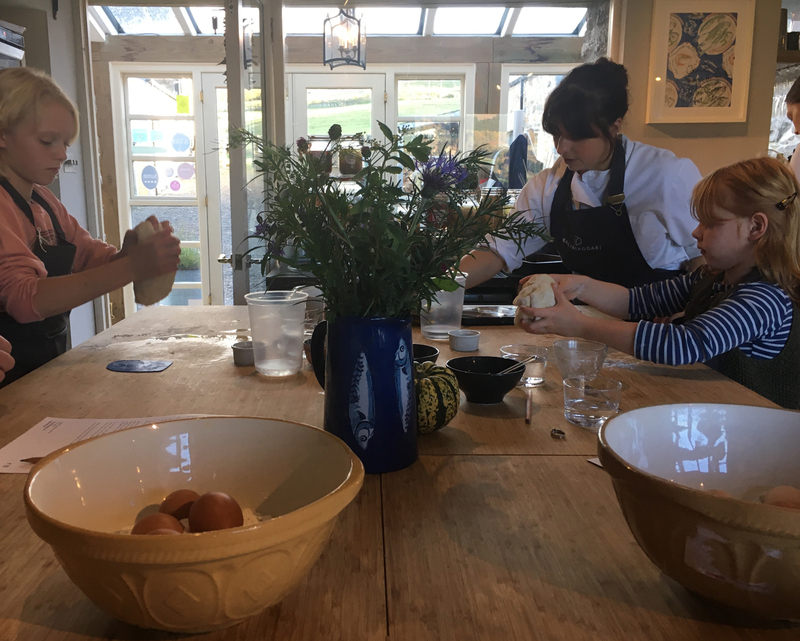 You can book Ballintaggart Farm here and see what’s on in their cookery school here. Looks like the perfect holiday!